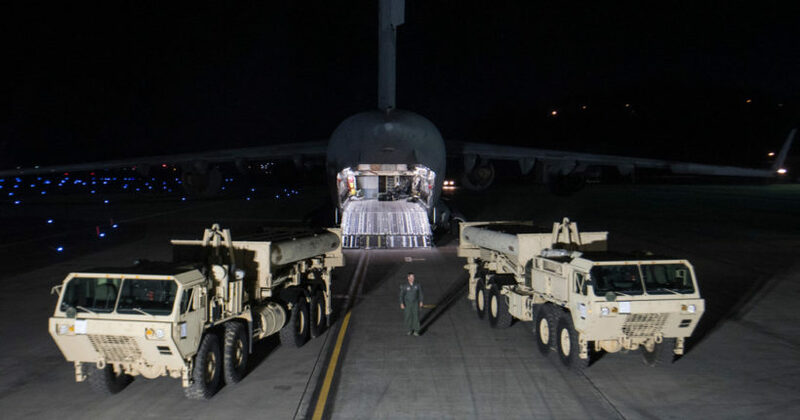 On Monday, the US military began deploying an anti-ballistic missile defense system, 'Terminal High-Altitude Area Defense' (THAAD), to South Korea. The equipment arrived at Osan US Air Base in Pyeongtaek, south of Seoul. (by Justin McCurry in Tokyo and news agencies, UK Guardian) — The threat posed by North Korea to the US and its allies has entered a “new phase,” President Donald Trump said on Tuesday, a day after the regime test-launched four ballistic missiles towards Japan. In a phone conversation on Tuesday, Mr. Trump told Japan’s prime minister, Shinzo Abe, that the US stood “100%” with Tokyo after three of the intermediate-range missiles landed in the sea off Japan’s north-west coast. “President Trump told me that the United States was with Japan 100%, and that he wanted his comments to be communicated to the Japanese people,” Abe told reporters at his residence. “He said he wanted us to trust him as well as the United States 100%. The comments came as the US said the “first elements” of its missile defense system had arrived in South Korea on Tuesday. The Terminal High Altitude Area Defense (THAAD) anti-missile system is meant to intercept and destroy short- and medium-range ballistic missiles during the last part of their flights, the US Pacific Command said in a statement. “Continued provocative actions by North Korea, to include yesterday’s launch of multiple missiles, only confirm the prudence of our alliance decision last year to deploy THAAD to South Korea,” US Pacific Commander Admiral Harry Harris said. China has denounced THAAD’s deployment, [claiming] it would compromise its security. South Korea’s Yonhap news agency, citing military sources, said the system could be operational as early as April, well ahead of schedule. Mr. Trump and Mr. Abe spoke as the North Korean leader, Kim Jong-un, declared the launches a success and warned that they were part of a training exercise for an attack on US military bases in Japan, home to almost 50,000 American troops. 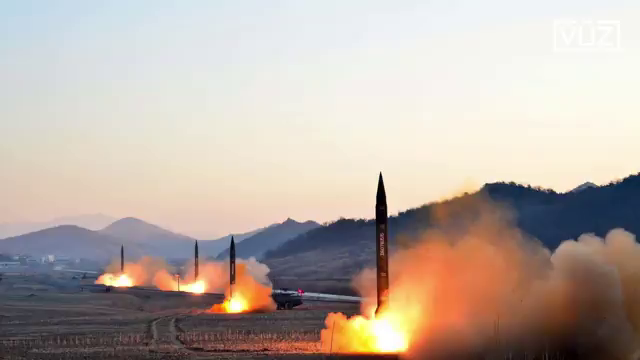 “The four ballistic rockets launched simultaneously are so accurate that they look like acrobatic flying corps in formation,” the state-run Korean Central News Agency quoted Kim as saying. The regime also released images of the missile launches, with a smiling Kim in attendance. The launches were seen as a protest against the start of the annual joint military exercises the U.S. conducts with South Korea that Pyongyang claims are a rehearsal for an invasion of North Korea. A day after operation Foal Eagle began last Wednesday, North Korea’s army, deploying the same vitriolic language it reserves for the annual drills, warned that it was ready to “immediately launch its merciless military counteractions” if South Korean or US forces fired “even a single shell” into waters near the divided Korean peninsula. Prime Minister Abe said that President Trump, who was diplomatically wrong-footed by a North Korean missile launch last month, had reaffirmed Washington’s “unwavering” commitment to Japan’s security. The leaders agreed that Monday’s launches were in violation of UN resolutions banning Pyongyang from developing ballistic missile technology. Washington and Tokyo have requested a meeting of the UN security council on Wednesday. … The UN has imposed six rounds of sanctions since the North conducted its first nuclear test in 2006, but they have failed to dent the regime’s quest to build what it claims is a “defensive” nuclear arsenal. Choi Kang, an analyst at the Seoul-based Asan Institute for Policy Studies, said the launch was a warning to Tokyo. “North Korea is demonstrating that its target is not just limited to the Korean peninsula any more but can extend to Japan at any time and even the US,” he said. Reprinted here for educational purposes only. May not be reproduced on other websites without permission from the UK Guardian. 2. How did President Trump respond to North Korea’s latest aggressive action? Be specific. 3. a) What is THAAD? b) What is its purpose? 4. a) What did U.S. Pacific Commander Admiral Harry Harris say about North Korea’s launch of four ballistic missiles towards Japan? b) The U.S. had planned during the Obama administration to deploy THAAD to South Korea. Why did the Trump administration move up the date of deployment? c) When is the THAAD system expected to be operational? 5. For what reason does China oppose the U.S. deployment of the THAAD to South Korea? 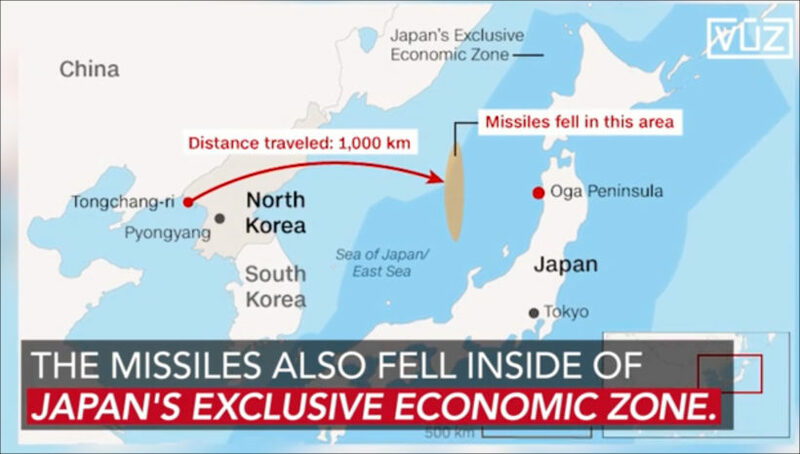 6. a) How did analyst Choi Kang explain North Korea’s most recent ballistic missile test? China is North Korea’s most important ally, biggest trading partner, and main source of food, arms, and energy. It has helped sustain Kim Jong-un’s regime, and has historically opposed harsh international sanctions on North Korea in the hope of avoiding regime collapse and a refugee influx across their 870-mile border. China regards stability on the Korean peninsula as its primary interest. Its support for North Korea ensures a friendly nation on its northeastern border and provides a buffer between China and the democratic South, which is home to around 29,000 U.S. troops and marines. “For the Chinese, stability and the avoidance of war are the top priorities,” says Daniel Sneider of Stanford’s Asia-Pacific Research Center. President Trump has said that China should be able to persuade North Korea to give up its nuclear weapons program. Do you agree with this assertion? Explain your answer. U.S. Defense Secretary James Mattis warned North Korea on Friday, Feb. 3 of an “effective and overwhelming” response if Pyongyang chose to use nuclear weapons, as he reassured Seoul of steadfast U.S. support at the end of a two-day visit. North Korea, which regularly threatens to destroy South Korea and its main ally, the United States, conducted more than 20 missile tests last year, as well as two nuclear tests, in defiance of U.N. resolutions and sanctions [and in a challenge to the Obama administration]. In September 2005, as a result of illegal acts committed by the North Korean government, including the counterfeiting of U.S. money, the U.S. froze North Korea’s overseas bank accounts. The North Korean government then refused to participate in further six-party talks.